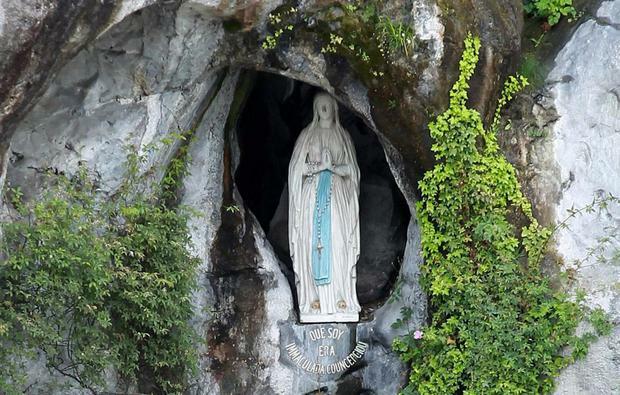 A row has erupted in the pilgrimage town of Lourdes over the planned privatisation of dozens of tiny shops and stalls selling holy water and religious trinkets. For generations, the stalls and shops have been leased by the municipality to local families for minimal rent as a way to distribute the wealth brought to the small French town by pilgrims travelling from around the world. The local council now wants to sell the shops to private owners in order to pay off municipal debt, but the tenants are up in arms. Many families in the town of 13,500 people in the foothills of the Pyrenees hold stakes in the 66 shops and stalls. They argue the sale will jeopardise their livelihoods because they will be unable to find the money to buy them. Josette Bourdeu, the town's left-wing mayor, is anticipating a windfall of at least a million pounds from an initial round of sales this year - with more to follow in subsequent years. "All my predecessors have grappled with the issue of the stalls, in view of the low revenue that is collected compared with their sales figures," she said. The municipality receives annual rent of €390,000. Stallholders declined to divulge their turnover when asked, but Lourdes attracts more than six million visitors a year and many purchase bottles of holy water, statuettes of the Virgin Mary and rosaries. The trade in devotional items and Lourdes water, reputed to have healing properties, has flourished since apparitions of the Virgin Mary, reported in the 19th century, transformed the town into one of the world's best-known shrines. Many pilgrims have claimed to have had illnesses cured by the water. The Church has certified some 70 miracles at Lourdes but has never formally encouraged the devotional use of the water. Bruno Vinuales, a former deputy mayor, has resigned over the plan, accusing the mayor of "selling the family jewels to fill up the coffers which she herself has emptied with reckless spending".